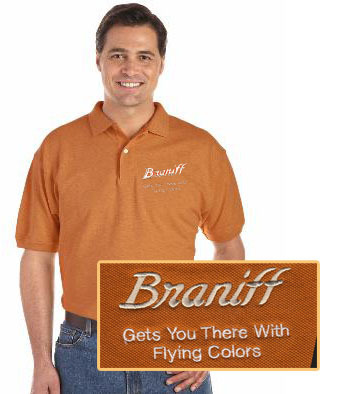 We have done a lot of great Polo shirts, and Braniff is one of the best! The logo, and "Gets you there with Flying Colors"! On a 100% cotton Pique' Polo, of course in Orange! Clean finished placket with reinforced bottom box, contoured welt collar and cuffs, double-needle bottom hem; three-button placket with wood tone buttons. If you worked for BN, or just loved the Airline, this shirt is for you!